With Gabriel Jesus out, Sergio Agüero is once again the man and he’s showing that he can still do what he has always done, as he scored the crucial first goal in a Manchester City 2-0 victory over Sunderland. Just four weeks ago, the man with the best goals-to-minutes ratio in Premier League history sat on the Manchester City bench. A 19-year-old Brazilian had taken his place. On February 5, Sergio Agüero did come on as City struggled to beat Swansea, but Gabriel Jesus, the man starting in the Spaniard’s place, scored both goals including the late winner. If Jesus had not suffered a severe injury early in the next match at Bournemouth, Agüero might have on the bench again at the Stadium of Light on Sunday scrolling on his phone through real estate listings for Madrid and Paris. With Gabriel out, Agüero is once again the man and he’s showing that he can still do what he has always done, as he scored the crucial first goal in a 2-0 victory. Agüero had started and scored twice in each of City’s previous two games, a Champions League match against Monaco and an FA Cup replay against Huddersfield. In both, Pep Guardiola, who had so recently not wanted to start Agüero, wouldn’t let him finish, eager to protect his best scorer. On Sunday, after 42 minutes, Agüero reacted first to Raheem Sterling’s low cross and flicked the ball past Jordan Pickford from close range. It was a signature goal. It meant Agüero had scored five goals in 131 minutes of soccer, an even faster clip than his unequaled Premier League rate of a goal every 109 minutes. The goal Sunday punctuated the fragile confidence with which Sunderland had started. From then on, City dominated the bottom team. Leroy Sané added a second. Agüero could have had a couple more. Next season, Jesus might again take Agüero’s place. For now, his goals give City hope in the Champions League and the FA Cup and even in the league where it trails Chelsea by eight points gap ahead of the leader’s visit to West Ham on Monday. THE KANE GANG The 3-2 score-line at White Hart Lane on Sunday makes it seem as if Everton ran Spurs close. Yet for most of the match, this was easy for Spurs. Perhaps it was too easy. Everton did not manage a shot in target until the 70th minute – and that was a tame chip from Ross Barkley. 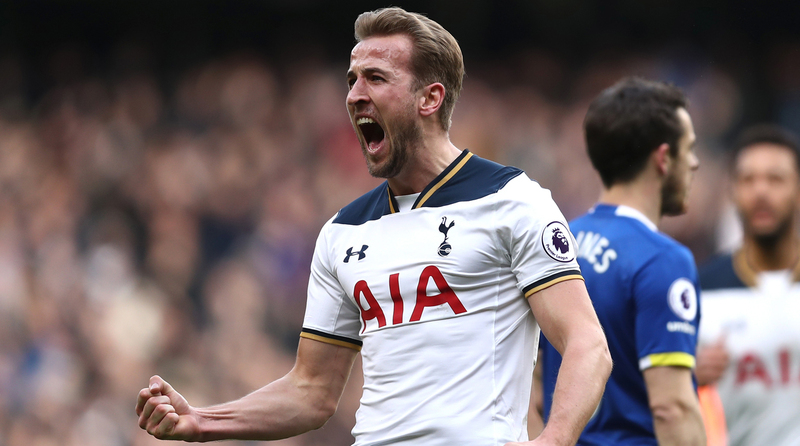 By then, Harry Kane had scored two more goals for Tottenham and will have been regretting two more good chances he hit straight at Joel Robles. He managed as many shots on target, four, as the entire Everton team. After 80 minutes, the first crack appeared in the Tottenham. Jan Vertonghen fell over. Romelu Lukaku, free for the first time all afternoon, scored. Yet there was little sign of Spursy nerves from the home team. Dele Alli clipped the ball past Robles in added time. With their two-goal lead, restored Spurs fell asleep and allowed Enner Valencia to strike from close range in the dying seconds, making Everton the first visiting team to score two at the Lane all season. In recent seasons, Spurs have made a bad habit of throwing away victories in games they dominated. This time, all their carelessness did was to allow Everton to salvage some self-respect. That’s a sign of growth. THE ZEN OF LIVERPOOL Once again, Liverpool followed a limp loss to a struggling team with a dominating victory over a top six rival. On Saturday, Liverpool blew away Arsenal, 3-1, at Anfield. Yet five days earlier, Liverpool had surrendered, by the same score, away to a Leicester team which started that match in the bottom three. There is an issue with Liverpool, but it takes two teams to make a match. Perhaps the paradoxical lesson of the last couple of months is that opponents who set out to beat Liverpool lose, while teams which try only to avoid defeat, can win. Arsenal, like Tottenham on Feb. 11, came to Anfield hoping to land a three-point blow in the five-way brawl for second place. Like Tottenham, the Gunners were quickly hit with a pair of vicious counter-punches. Arsène Wenger had tried to hedge his bets. He picked two holding midfielders, dropped Alexis Sánchez and played Olivier Giroud and Danny Welbeck up front. The idea, the Arsenal manager said, was to beat Liverpool’s pressing game with long, high balls up to attack. Yet Wenger has spent more than 20 years coaching Arsenal to play short. In a dazed and half-hearted first half, the Gunners did not hoof upfield once. Instead they were undone in the ninth minute by their own inability to defend a long clearance by the Liverpool goalie, Simon Mignolet. Roberto Firmino beat one Arsenal center back, Laurent Koscielny, to win the header, which tiny Phillippe Coutinho collected as the other Arsenal center half, Shkodran Mustafi, wobbled uncertainly. Seconds later, Firmino, having shed Koscielny in the sprint to the goalmouth, put Liverpool ahead. The rout was on. The message is clear. If you want to beat Liverpool, you must clear all thoughts of winning out of your head. If you want to score against Liverpool, you can only do so by focusing entirely on defense, although having a player like Sánchez on the field helps. He came on in the second half and set up Arsenal’s consolation goal. HEAD SPINNING There were some seriously bizarre moments during Manchester United’s 1-1 home draw with Bournemouth and Burnley’s 3-2 loss at Swansea. Yet perhaps the most bewildering were the post-match attempts of some of those involved to spin events in their favor. Just before half time at Old Trafford, Zlatan Ibrahimovic lined up Tyrone Mings as they jump for a header and then whacked an elbow into the defender’s face in two distinct and violent movements. “I jump up, I jump high, same time I protect myself,” Zlatan told the BBC after the game. “Unlucky he jumps into me,” he went on, eyes wide with childlike innocence. After a brief, thoughtful pause, he added” “Yeah, he jumps into my elbow,” his voice quivering with the excitement of someone who has just been struck by a remarkable insight. Zlatan may well have been seeking understandable revenge. Mings stamped on the striker’s head a few seconds earlier. That might have been accidental. If not, it, in turn, could have been revenge, for Zlatan stamping, a little more delicately, on Mings’ leg or hurling Mings to the ground before that. Whether the incident stays goes any further, depends on what Kevin Friend, the referee, writes in his report. After the fracas that followed Zlatan’s aerial assault, Friend issued a second yellow card Andrew Surman, the Bournemouth captain, who eager to stand up for Mings ran you to Zlatan and gave the Swede a schoolyard shove. Surman is 5-foot-10, Zlatan is 6-5 yet he went flying, as if elbowed by an elephant. Friend then spoke to Zlatan which suggests he knew the Swede had done something naughty. If the referee reports the incident and says he did not judge it worthy of punishment, which would be astonishing, the matter is, indeed, over. If Friend missed the elbow, then Zlatan is looking at a three-match ban once the disciplinary panel watches the X-rated video. That will be a serious loss. United stretched its unbeaten league run to 17 games, but against 10 men and even with the help of a generous penalty – which Zlatan did not convert - United could not score. Without Zlatan, United will struggle even more to turn draws into victories and break into the top four. Earlier, Fernando Llorente scored in the 92nd minute to give Swansea victory over Burnley. Llorente perfectly judged a high, curling cross. Ben Mee, the nearest Burnley defender, did not. Finding himself under the ball and with little chance of reaching it, Mee jumped anyway to block Llorente who was already flying to meet the ball. Llorente removed the dangerous obstacle by giving Mee a sharp shove between the shoulder blades. “It’s a foul,” Sean Dyche the Burnley manager complained to the BBC, suggesting, wrongly, that Llorente was only able to jump so high because he leveed himself off Mee. It seems remarkable that Dyche had the nerve to complain about the result or the referee. Swansea only needed the late, late winner because it had hit the woodwork four times and because Anthony Taylor made the most bizarre refereeing error of the day. After 20 minutes, when a corner flew into the crowded Swansea goalmouth, a bare arm reached up and flapped it away. Taylor gave a penalty. Burnley levelled. The only problem was that the arm belonged to Sam Vokes of Burnley. A give-away, Dr Watson, might have been that all the Swansea players in the vicinity were wearing long-sleeved white shirts. Vokes was in shirt sleeves. But Dyche could laugh at one peculiar sub-plot that linked the two refereeing disputes. Taylor had taken a break in in midweek for to stage a three-day stag party in Marbella, Spain. Friend was one of his guests. Maybe managers, and players, should try harder to remember that referees are humans too. FORGETTING RANIERI Leicester put some daylight between itself and the relegation places with a second 3-1 victory in five days. On Monday, Leicester rediscovered its title-winning energy and Jamie Vardy his goal-scoring form. On Saturday, it was Riyad Mahrez who channeled the mesmeric touch of last season as he scored the crucial second goal. Why the team refused to play like this under Claudio Ranieri remains a troubling question, but having got rid of the man who led them to the title, Leicester looks like a team again. Firing him might have felt all wrong, but its turning out to have been right.